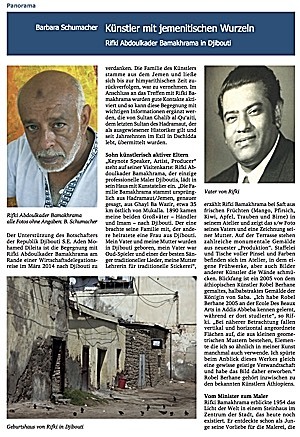 In der aktuellen Ausgabe der Zeitschrift "Jemen-Report" widmet Barbara Schumacher einen ausführlichen Artikel dem dschibutischen Künstler mit jemenitischen Wurzeln Ricki Abdulkader Bamakhrama. Djibouti, situated at the Horn of Africa, is a member country of the Arab League. In Germany it is mainly known because of the UN Atalanta Mission and its big salt deposit (Lac Assal). The country has just the size of Hessen and a population of about 850 000. Approximately 500 000 people live in the capital which has the same name as the country. Djibouti is considered as a stable country and attracted a certain attention in recent times because of the extensive development of its infrastructure, e.g. the container terminal of Doraleh (which is the biggest and most modern port of its kind in Eastern Africa), as well as several other ambitious and huge economic development projects, - this all against the background of the positive developments in the neighboring country Ethiopia which doesn't have a port. The first Djibouti-German Economic Conference in Djibouti took place in March 2014, which had the objective to attract German investors towards Djibouti.